PRESIDENTIAL hopeful Gavin Duffy was paid €10,000 for public relations services he provided to former Taoiseach Enda Kenny, Independent.ie can reveal. Mr Duffy was also paid €10,000 to moderate last year’s Fine Gael leadership election hustings which resulted in Leo Varadkar becoming party leader and Taoiseach. The Dragons’ Den star revealed the payments following a series of questions from this website about his business dealings with political parties. However, Mr Duffy insisted he has no affiliation with any political party. 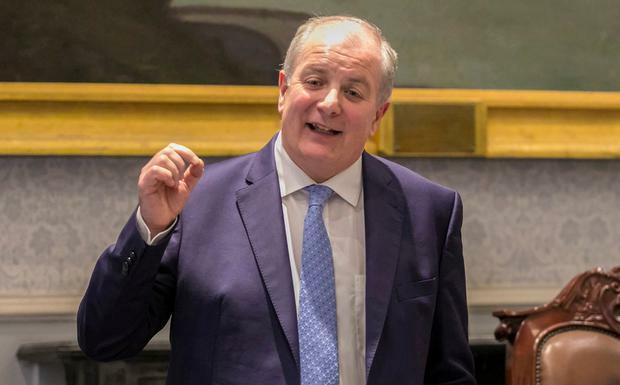 The businessman said his communications company, Gavin Duffy and Associates, provided services to Taoiseach Enda Kenny during the 2011 General Election campaign. Fine Gael formed a coalition government with the Labour Party after the election. Mr Duffy also said he worked with three other Taoisigh during his time as an employee of Carr Communications. However, he is not in a position to provide information on the clients of another private company. During last year’s Fine Gael leadership contest between Leo Varadkar and Simon Coveney, Mr Duffy was paid €2,500 for each the hustings he moderated. A Fine Gael spokesperson confirmed the party has enlisted the services of Mr Duffy but refused to say how much they paid the businessman. “I can confirm Mr Duffy has worked with Fine Gael on a professional basis in the past. I cannot disclose details of professional contracts,” she said. Mr Kenny did not respond to requests for comment. Earlier this week, the Irish Independent revealed that Mr Duffy’s company was paid €9,000 by Fianna Fail Louth TD Declan Breathnach for public relations advice. Mr Duffy’s son Lorcan, who works for his father’s company, was seconded to work with Mr Breathnach for six months. Mr Breathnach has publicly declared he will vote for Mr Duffy in a presidential election despite Fianna Fail’s position being to support a second term in office for Michael D Higgins. Mr Duffy said his company has no contracts with “public organisations” and as a rule does not tender for public contracts. He revealed he was paid €5,000 per series for the Dragons’ Den television show by production company Shinawil. Mr Duffy said he is running a transparent election campaign and is planning to personally respond to all questions put to him by the media. If he gets a nomination to officially run against Michael D Higgins he will appoint a press team who will then deal with queries. “I truly believe I have nothing to hide, fear no enquiry but will have to explain the context of certain things, and I am happy to do that,” he said. Last week, he sought a nomination from Waterford County Council and attended the Galway Races. He has also being personally seeking the support councillors though phone calls and meetings.